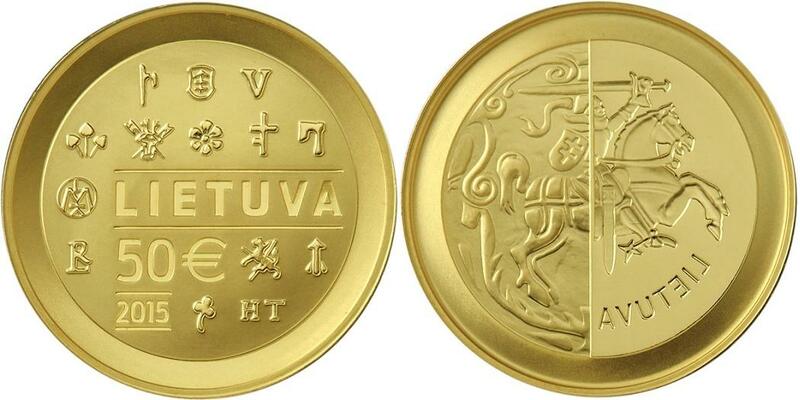 (mm) By coining a 50 Euro gold coin (999/1,000; 5,000 copies in proof) Lithuania reminds of its coinage history. This is Lithuania's first commemorative coin since the introduction of the Euro this year. The reverse shows various symmetrically aligned old coins as well as the denomination value, state name and year of issue. The obverse shows a collage of a coin die connecting an old and a new coin die bearing the "Vytis" coat o arms. As it is common for coin dies the coat of arms and state name are mirrored.